1. Already a Premium Listing Subscriber at www.Estimator4U.com, just Sign in and start creating Detailed Cylinder Repair Estimates. 2. 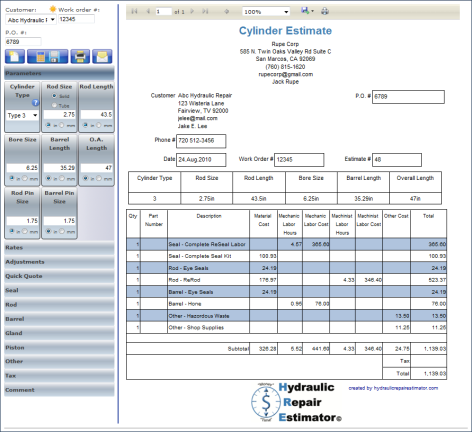 Want to Test Drive our Detailed Hydraulic Cylinder Repair Estimator, Check Out our DEMO. 3. Request for information about our Membership and gaining full access to this Online Tool. Step 1. Provide the following information. Step 2. Choose the Types of Repairs your Company performs. Step 3. Choose your company's service radius. Step 4. Add any comments. Step 5. Click Send Request for information. There are 2 Web Sites, each serves a particular purpose. 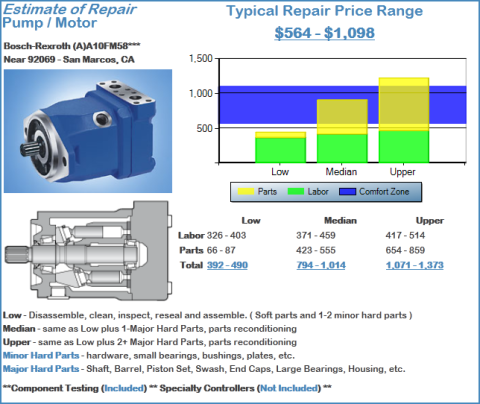 This website provides Hydraulic Repair Cost Ranges for Hydraulic Pumps, Hydraulic Motors, Hydraulic Cylinders and Hydraulic Hoses. Anyone in the World can go to this site and instantly create an Estimated cost of Hydraulic Repair. Along with the cost of hydraulic repair they will also get a list of Local and National Companies that provide the required hydraulic repair or replacement. All estimates are relative to their particular area of the country. 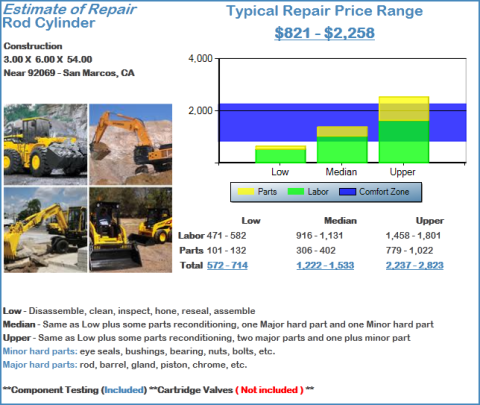 This website provides Detailed Hydraulic Cylinder Repair Estimates. Shops that perform Hydraulic Cylinder Repair and are a Premium Listing Subscriber on Estimator4U have full access (at no additional charge ) to this great online tool. This is a personal portal for each Company. They can create detailed Estimates for their customers using their specific labor rates and Company information. Copyright © 2010-2016 Rupe Corporation. All products and/or manufacturers contained within this site All rights reserved. The material on this site may not be reproduced and may not be distributed, proxy cached on AOL or otherwise used, except with the prior express permission of Rupe Corporation or the manufacturers owning the copyrights being requested in the United States and any other country.